Your Mom will love this stylish gift. This just might replace that macaroni necklace you made 20 years ago. There is no reason a child’s, grandchild’s, or grand-dog’s picture cannot be displayed around one’s neck tastefully, fashionably and inexpensively. 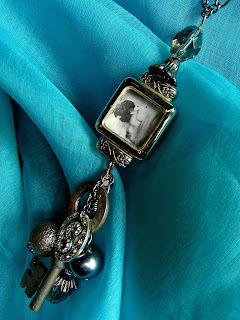 This gift should be sentimental so keep the tastes, likings, and your relationship with the person receiving the necklace in mind as you look for your findings. You should not have to pay more than $10 for your supplies for this necklace, but it will take a mild amount of planning. I do not wear watches. Therefore, I had to go find this one. 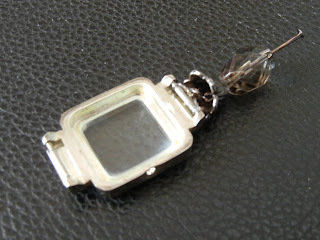 My mom wears a watch with little etched designs in the metal similar to the etching in this one. You may have a watch that has some significance, but now lacks use. That would be a good choice for the frame. 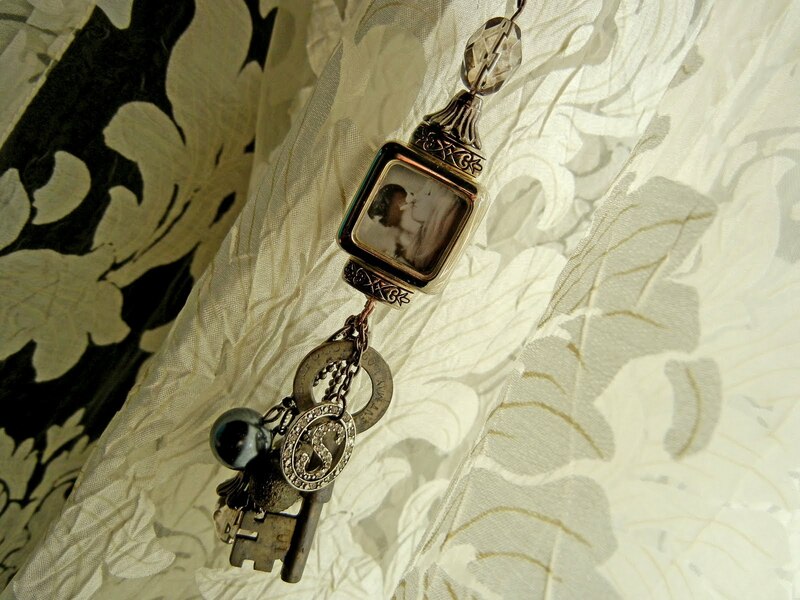 Find the watch you will repurpose into a frame first, this will be your focal point. 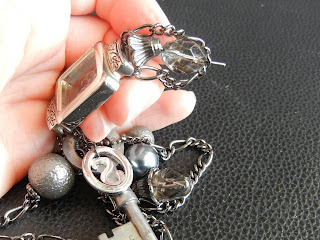 Use the focal point to build from when choosing the remainder of the necklace findings. face for color balance and directional flow. On to the pretties…My mom does not like a lot of glitzy shiny stuff. Therefore, this is not a glitzy shiny necklace…(we are totally night and day). Not to say I did not add a touch of sparkle just to brighten it up. Consider your textures and colors. You want the picture in the frame to capture the viewer first, but what will they look at next? 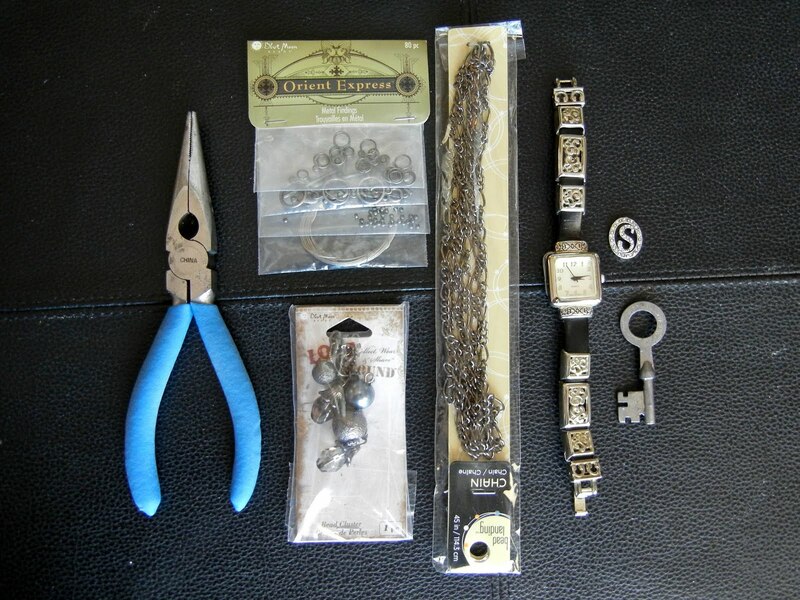 You will need a secondary piece of interest to draw the eye to all the fun and special pieces you add below. My mom’s name begins with an ‘S’. 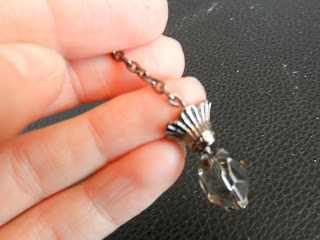 I had found this little charm some time back and filed it away in my jewelry findings, that I may use it for her later. I suppose I could have used a ‘G’ for Grammie, because that is who she is to Dash, who is pictured with me. It is up to you, whatever relationship you want to emphasize. You do not even need to use a lettered charm, just something that you think the recipient would like. Just make it visually interesting, but not competitive with the picture. Keys are great! (and really in vogue) As you know if you have read my other posts or if you know me personally I am all about symbolism. 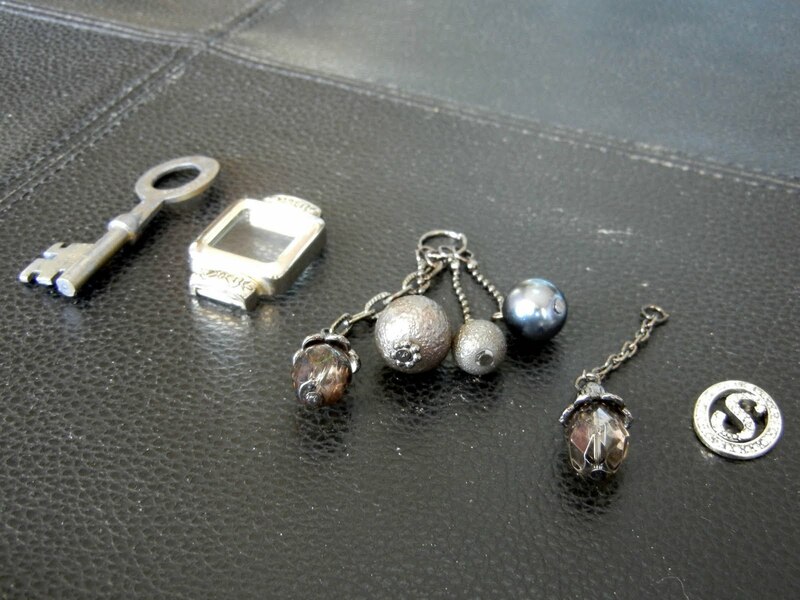 The first key you were likely ever given was a key to your house (your parent’s house). I chose to attach a key to this necklace, because my Mom will always be a sense of home for me. We may no longer live with our mothers. We may no longer want to live with our mothers, but, nevertheless, she will always be “home”. Now you need some filler pieces. 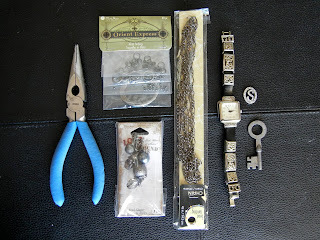 My best suggestion is to place your watch face, chain, secondary focal piece, and key in a baggy and head to your nearest craft store. Thankfully, I have a Hobby Lobby and a Michael’s locally. By no means am I knocking any boutiquey bead shops, but usually one of these two stores will be having a jewelry sale (buy-one get-one or something) and a huge selection for multiple tastes. 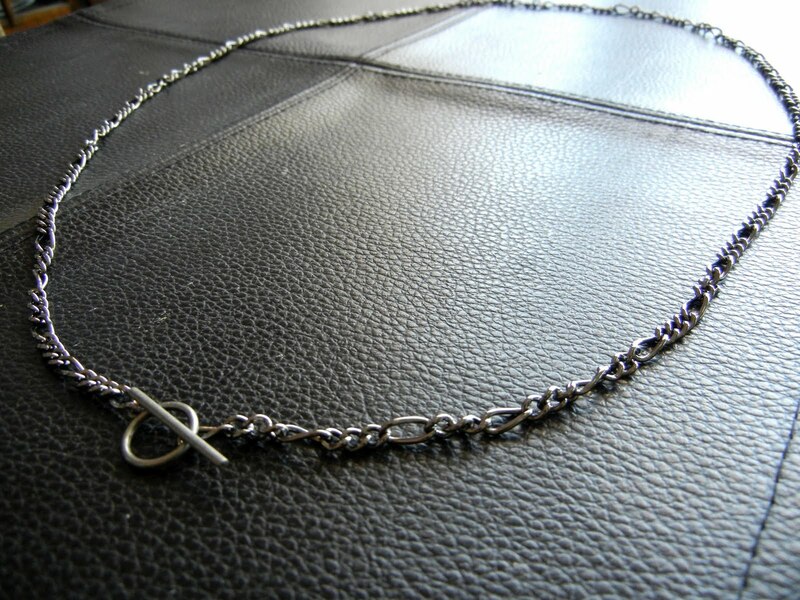 You may also want to take care of your chain purchase at the same time if you do not have an extra around the house. Remember groupings of threes or fives are visually attractive. At this point you already have two pieces, so you are looking for either one more piece or three more little pieces. You can make even numbers work (as I did) as long as they are background pieces and not distracting. 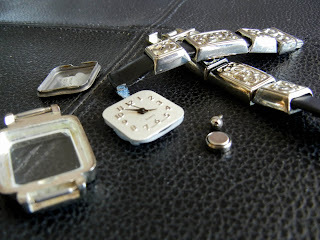 I chose a bundle of dangly beads this way I could take them apart and use one of the beads above the watch face and a similar one below for cohesion. 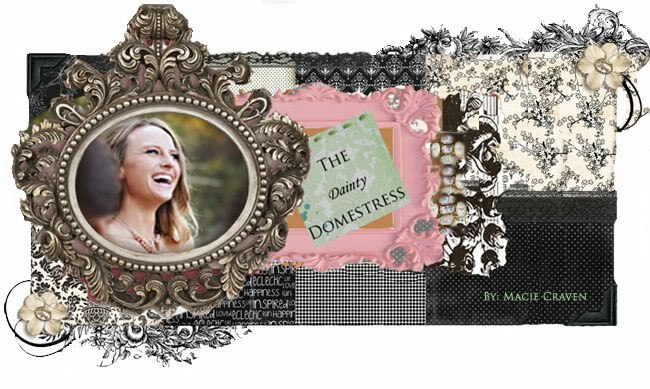 Your eye will naturally trace a path to like objects and colors…file that thought, you use it in this project. I did not have a thick enough chain for the watch face I chose. I bought this chain and decided on a length. My mom wears her necklaces longer and this style is not meant to rest too closely to the face. I added the toggles with a pair of pliers. 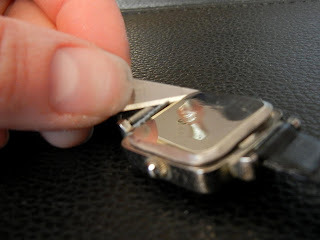 If you are having difficulty opening the chain or the jump ring (the small wire loop attachments often found on the sides of clasps) you may want to use a second set of pliers, a plumber’s wrench or a third hand. By all means, though, if you have a necklace around the house that will work, use it. Use a razor blade to remove the watch back. Or…take it to a jewelry store. Ask the man behind the counter sweetly, batting your eyes, if he would ever so kindly remove it for you free of charge. Remove the band and insides from the watch. Lay out your pieces. Look them over. You may want to borrow jump rings or other pieces to arrange them differently. Let’s start on the top end of the watch face. Cut about three inches of your jewelry wire. Thread it through the watch pin at one end. 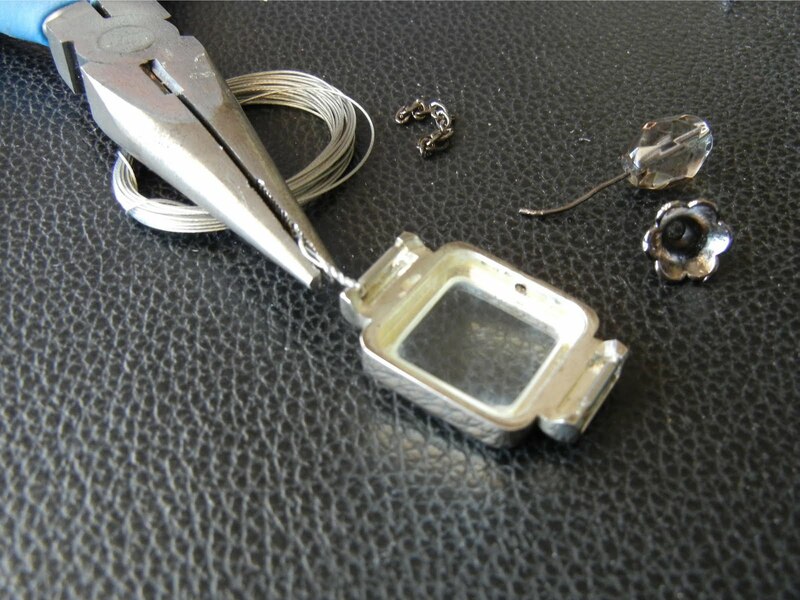 With your pliers in one hand holding the wire tightly and the watch face in the other twist in opposite directions. 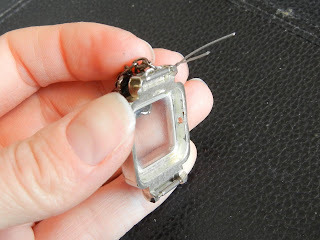 Twist the wire until it is long enough to reach the center of the watch pin. I detached the wire from the chain and silver piece by straightening the loop with the pliers. I flipped the silver piece over and placed it back on the wire. I then bent the end of the wire where I had previously straightened it, caught the last ring of the chain, and recreated the loop attaching it this time to the chain. This will now serve as the top attachment between the watch face and the necklace chain. Additionally, I decided to borrow the jump ring from the end of the chain and attached to the charm. This is what the end result for the top attachment should look like. Thread one piece of wire through the loop. Twist enough that it will hold. This is a little tricky…the wire is flattened at the end of the bead. Grab the flat piece and pull it the opposite direction from the watch face. You should be able to pull enough wire through that you will be able to make a loop out of it. If it is not long enough you will need to untwist the wire from the loop and move it down a loop or two. When you have established which loop is best twist the wire tightly, creating a wire rope long enough to reach the other end of the pin. This is what the top half should look like. If you choose to attach something else it should still look something like this. Notice the wire end sticky out from the bead. 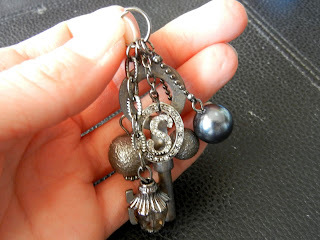 You will make a loop from this to attach to the necklace chain. 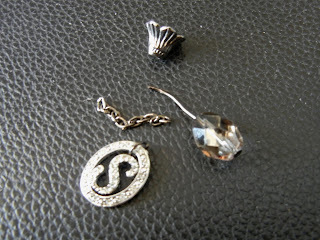 Note: If you find the first part too difficult do not attach anything but the wire between the pin and the necklace. Let’s move on to the bottom section. 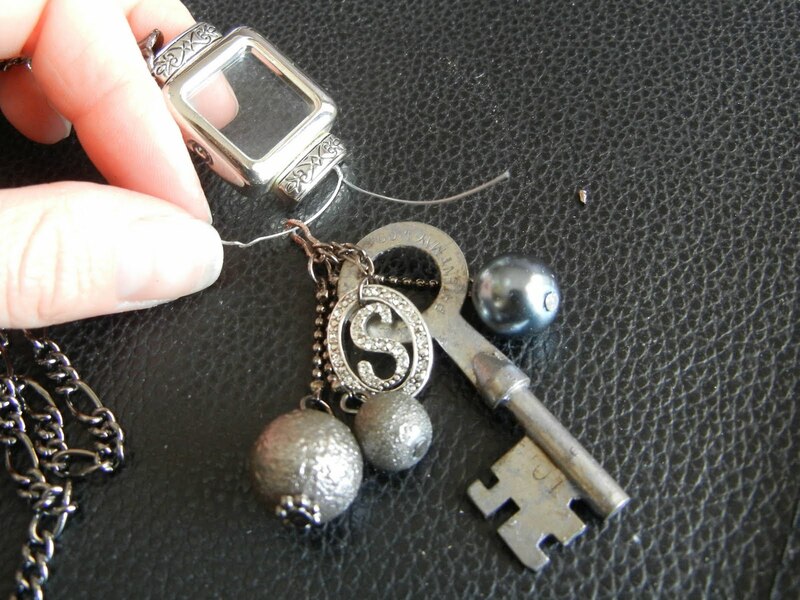 Arrange all of your bobbles, key and charm in the order you want them and attach them to a jump ring. 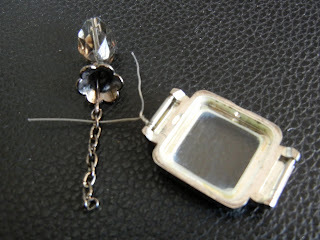 Again thread wire through the watch pin, twist to the center, attach to your pretties, twist, attach to the other end of the pin and clip the excess. Almost finished! Cut the flattened end of the wire. 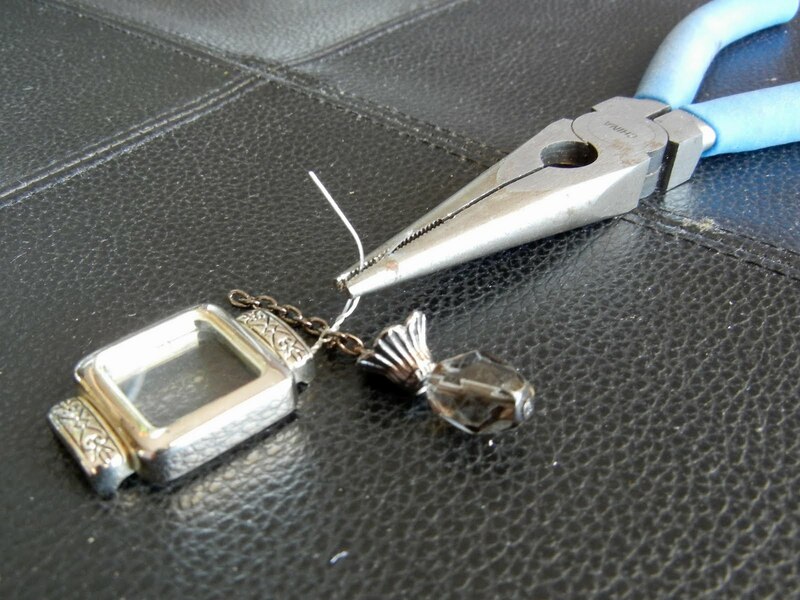 Thread the wire through the center loop of your necklace chain and bend the wire forming a loop with your pliers. Voila! Happy Mom, Pretty Piece! I seriously have to try this. I think it's such a stunning and sentimental piece. I'll definitely have to try first for myself. ;) Thanks for the share! ...and you will have such a huge collection of pretty pictures you take of your kids to put in the frame.